Pie connects people, pie is meant for sharing. Our featured pie for April! 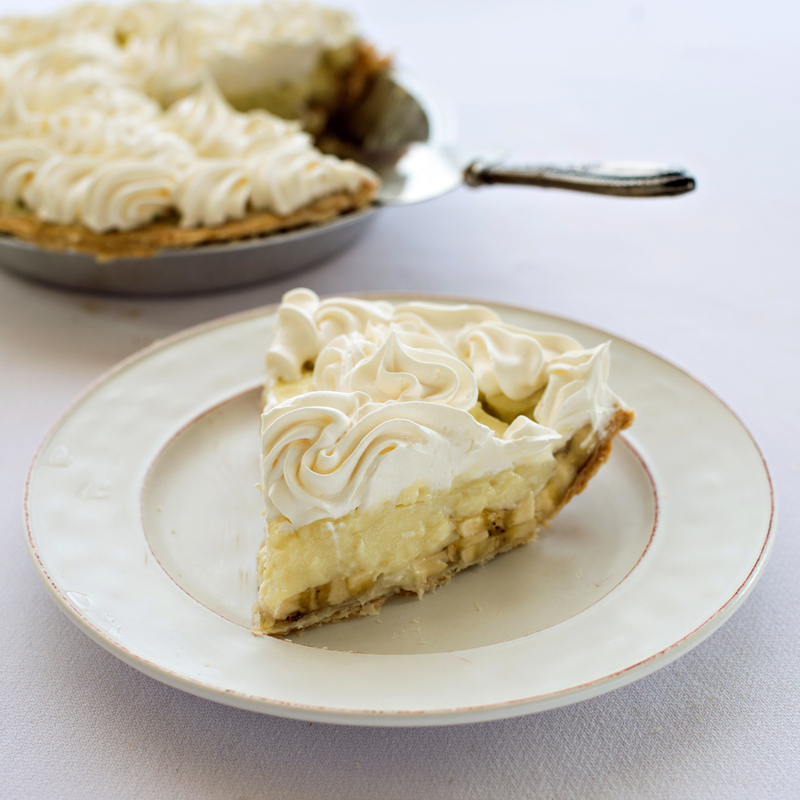 Made with real lemon juice and lemon zest, the tart filling is loaded into our delicious, flaky crust and topped with a mound of golden meringue. 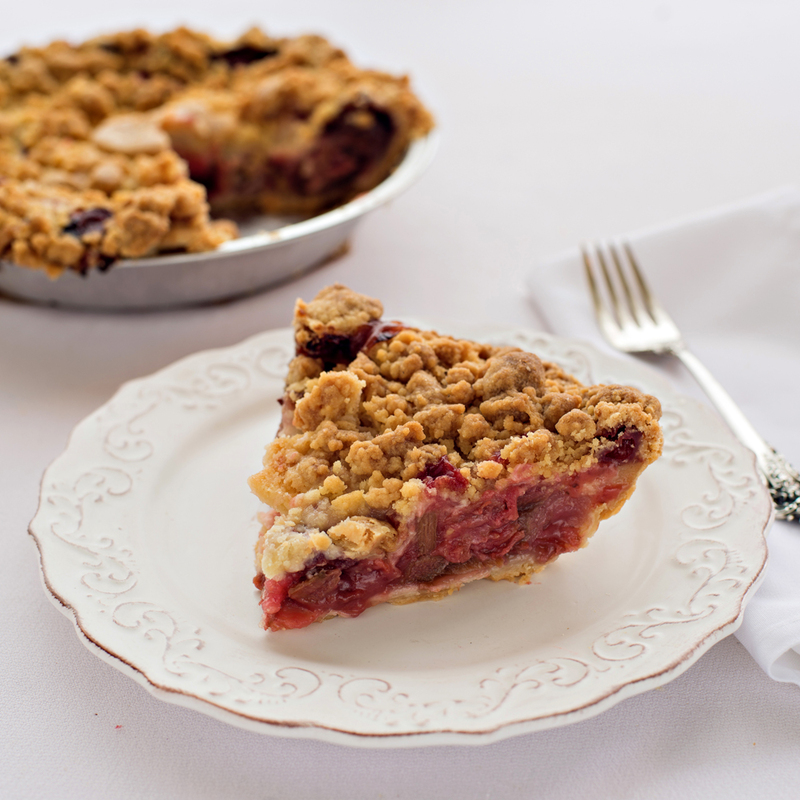 Our top selling pie made with tart Michigan Montmorency cherries, sweetened up with love and a toasty crumb topping. Our Cherry Crumb is the “Signature Pie” of the National Cherry Festival held in July in Traverse City every year! Tasty Montmorency cherries sweetened with apple juice, fill GT Pie’s flaky crust with a tangy deliciousness. 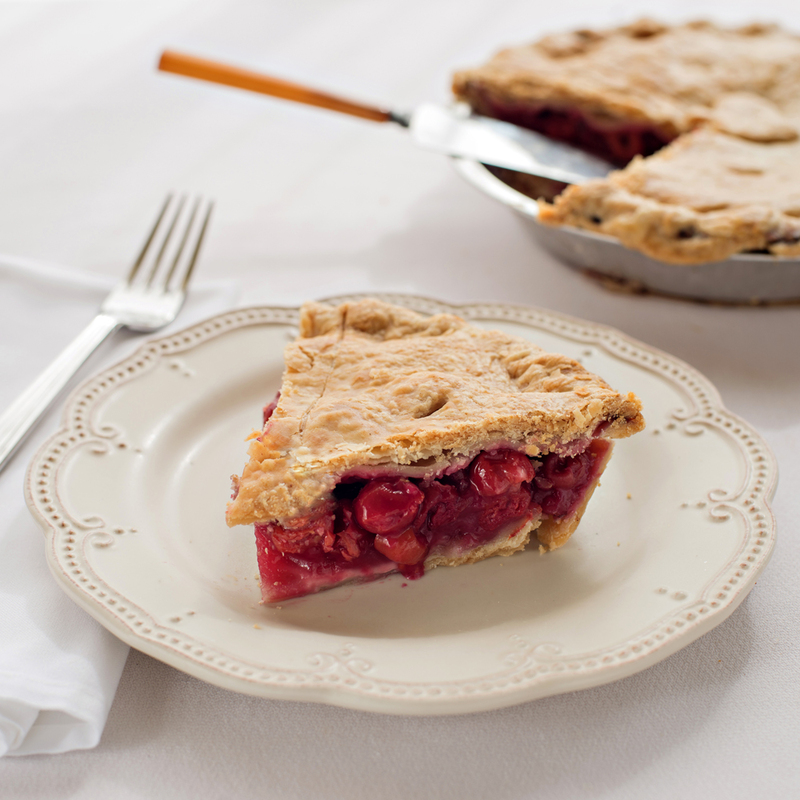 A delicious blend of Michigan Montmorency cherries and juicy raspberries in our flaky crust. We recommend enjoying this pie near one of Northern Michigan’s many beautiful lakes. Michigan Northern Spy apples, Michigan Rubel blueberries, Michigan Montmorency cherries – pure Michigan through and through. Finished with our toasty crumb topping. 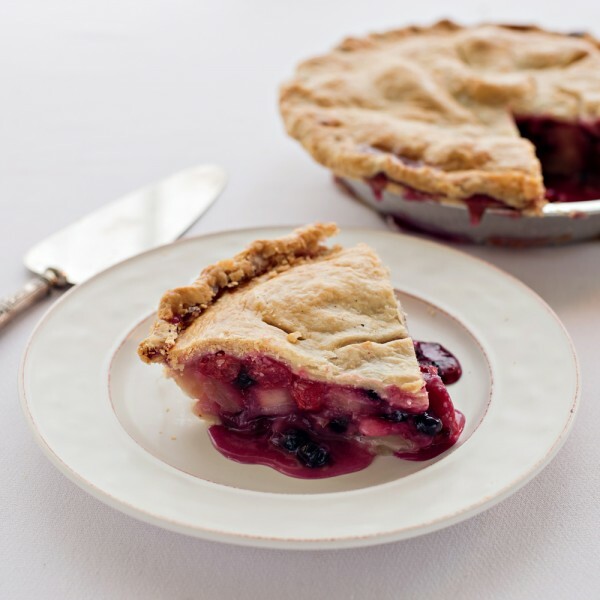 Michigan Northern Spy apples, Michigan Rubel blueberries, Michigan Montmorency cherries baked in our flaky, homemade crust – the essence of pure Michigan. This blend of Michigan Montmorency cherries and tree ripened Northern Spy apples is finished with our toasty crumb topping. 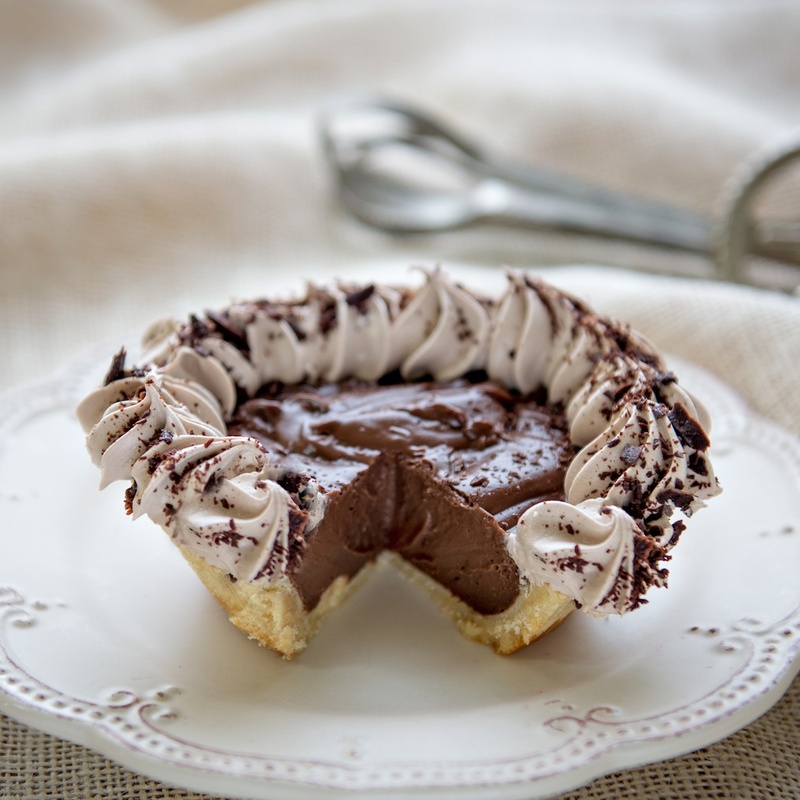 A mouthwatering pie! Our shining light! 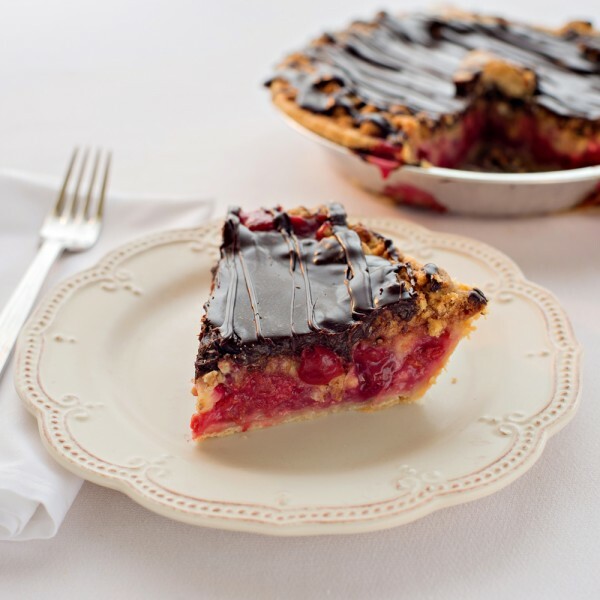 Our classic Grand Traverse Cherry Crumb Pie, made from Michigan Montmorency cherries, is topped with our homemade chocolate ganache. This is sure to become a favorite for those chocolate lovers, especially when served warm with ice cream! 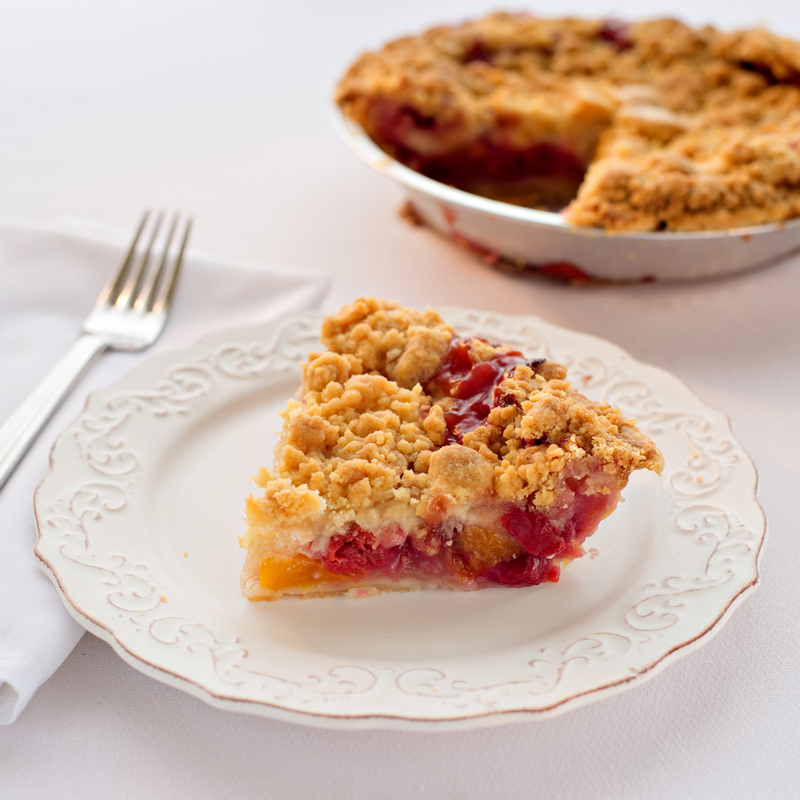 This pie is loaded with Michigan Montmorency cherries and sweet peaches, then finished with our amazing toasty crumb topping. A local favorite pie! The National Cherry Festival is a big event in our home town of Traverse City. When the local rhubarb is in season you might find us mixing our Michigan cherries with rhubarb for a special, seasonal treat. Sugar free! 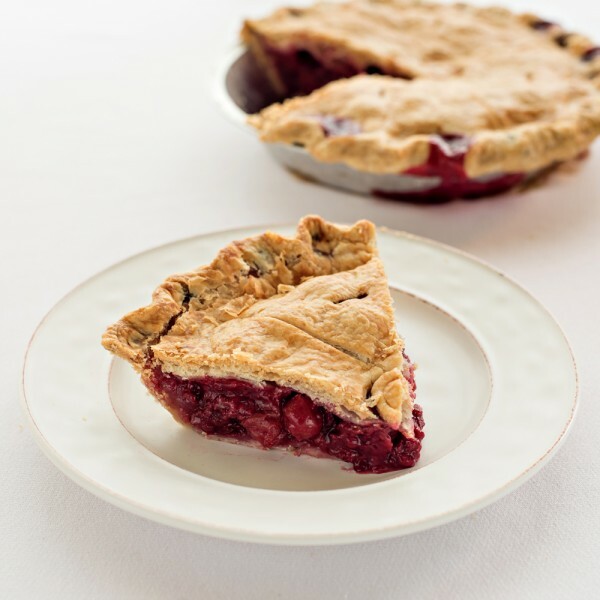 Sweetened with Splenda and filled with our Michigan Montmorency cherries. Sweets for all needs from GT Pie Co, splendid indeed. 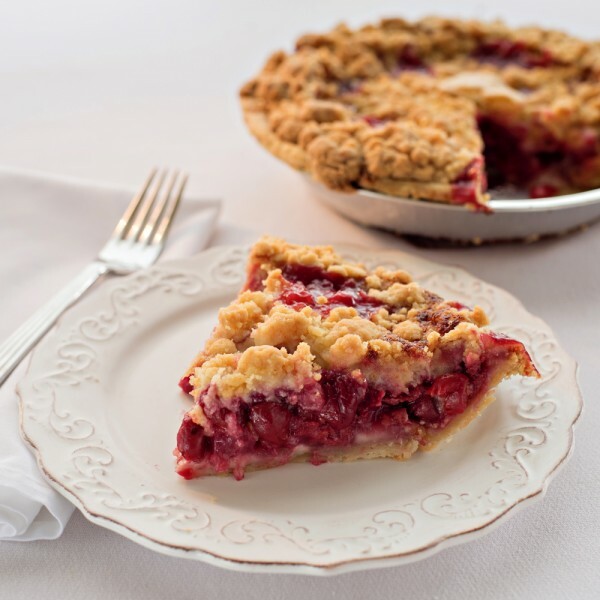 This handmade pie starts with a gluten-free shortbread pie crust, into which we add a Michigan tart cherry filling and then top it off with our delicious crumb topping and sliced almonds. Also available in apple and chocolate cream. Named for our many peninsulas in Northern Michigan. Filled with Michigan-picked, sun-ripened Northern Spy apples that have been tossed with cinnamon and sugar, and finished with our toasty crumb topping. Front Street is where our original shop first opened its doors! Michigan grown Northern Spy apples make this a good choice any time of year. Our homemade flaky pastry tops it off! 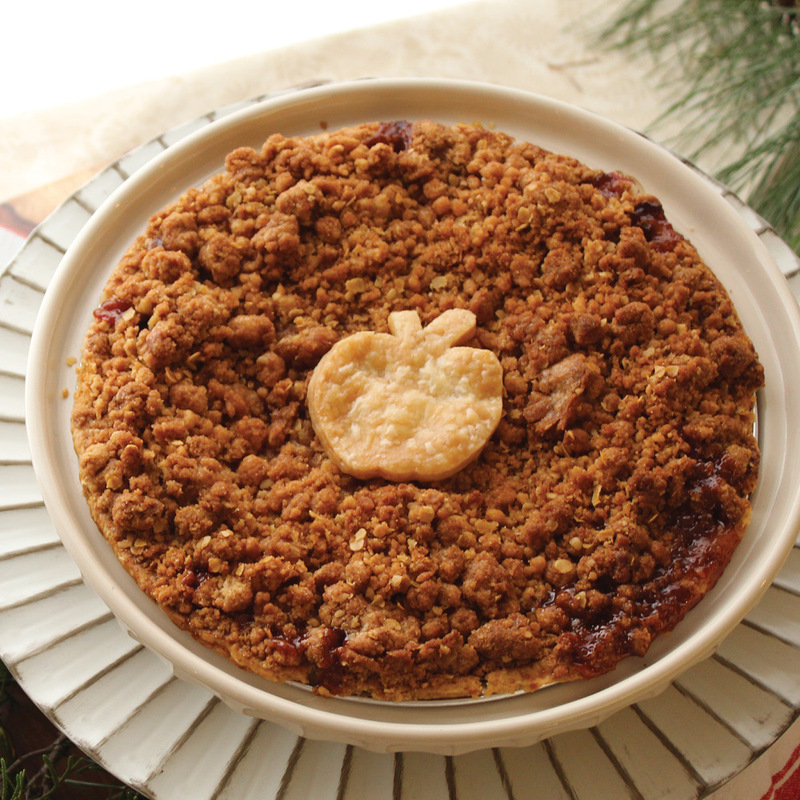 Our classic Apple Pie on the inside and topped off with a hearty cinnamon oatmeal crumb topping. 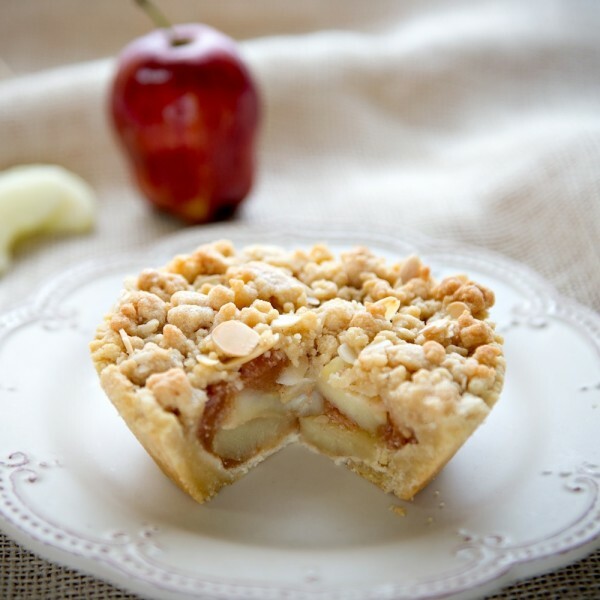 Filled with Michigan-picked, sun-ripened Northern Spy apples tossed with cinnamon and sweetened with apple juice then finished with our flaky pastry top. We start with our Peninsula Apple Crumb pie, then we add toasted pecans and drizzle of caramel on top to make a finale that will tempt every taste bud! 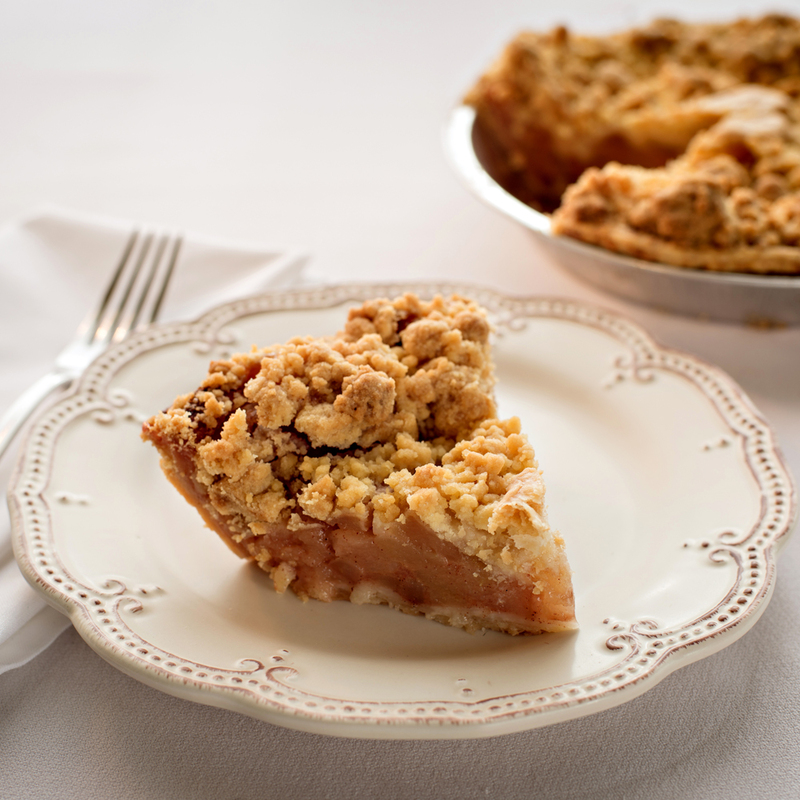 Perfect as a warm fall treat in honor of Northern Michigan’s cozy little towns. This glorious pie reminds us of the Legend of Sleeping Bear, whose Dunes were voted the most beautiful place in the country by ABC News. Seven whole, cored Michigan apples are tossed in cinnamon & sugar, baked in our flaky crust and finished with a drizzle of caramel. Sugar free! Sweetened with Splenda and featuring our Northern Spy Michigan apples, all made in our flaky pastry crust. Sweets for all needs from GT Pie Co., simply splendid. This handmade pie starts with a gluten-free shortbread pie crust, to which we add our Michigan Northern Spy apple filling with cinnamon, and perfected with our delicious crumb topping and sliced almonds. Its handmade taste is sure to thrill! 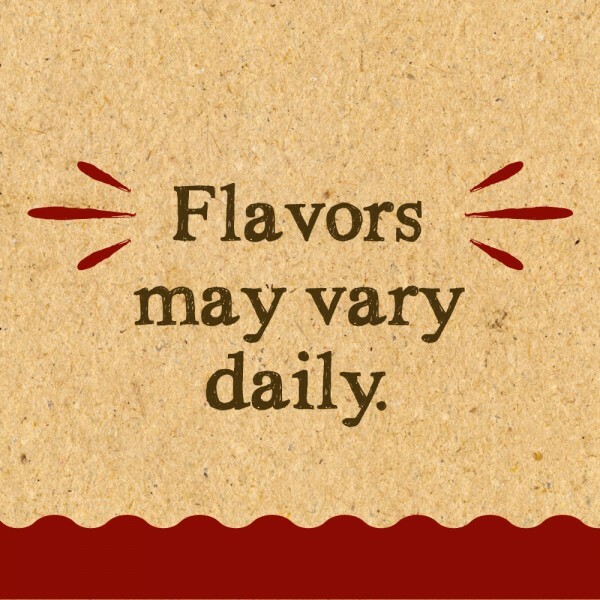 Also available in cherry crumb. 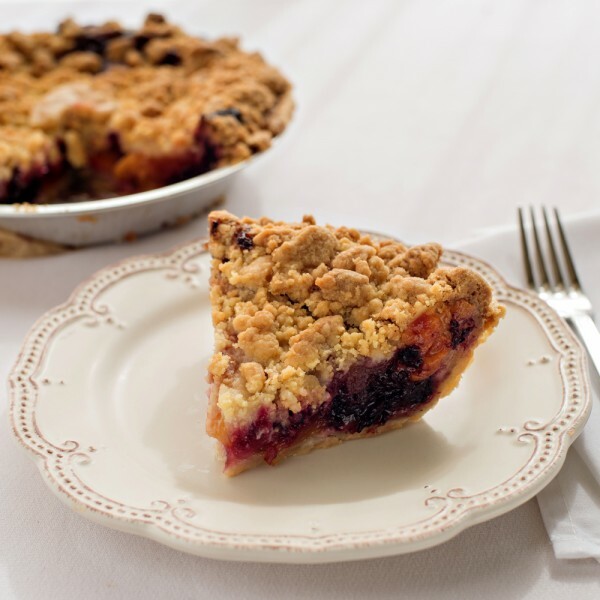 Juicy berries picked at the height of the season – a mix of strawberries, raspberries, blackberries – and Michigan Spy apples with our toasty crumb topping. 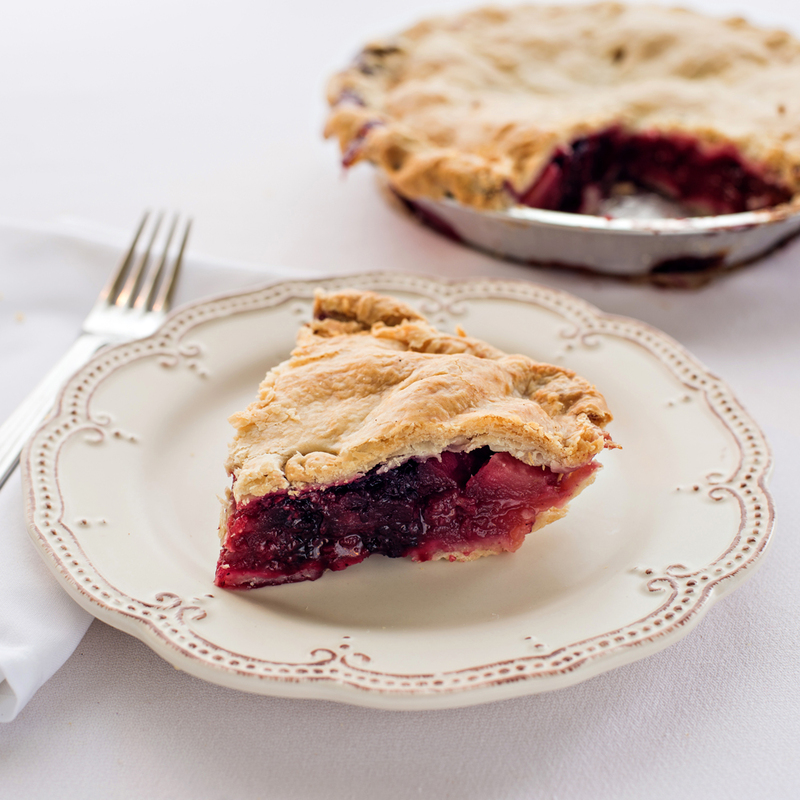 This pie pops with flavor and love from Michigan. Brimming with juicy berries picked at the height of the season, this is our mix of strawberries, raspberries, blackberries and Michigan Spy apples with our flaky pastry top. From the shores of Michigan to you. 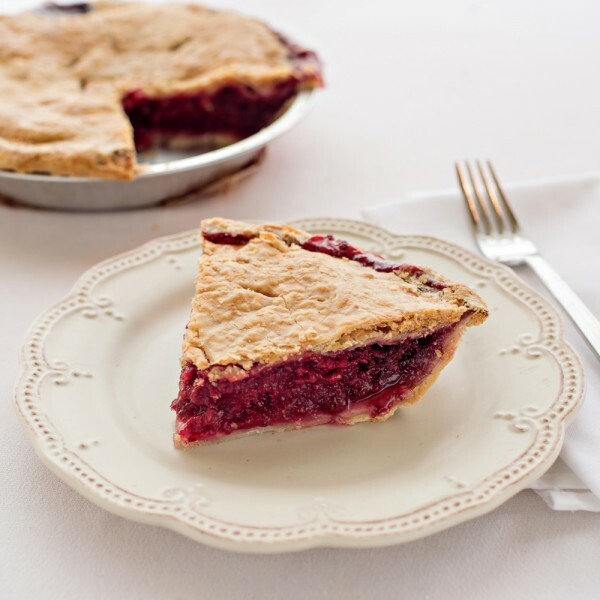 A blend of Michigan Rubel blueberries, raspberries, blackberries and ripe red strawberries in our flaky crust. 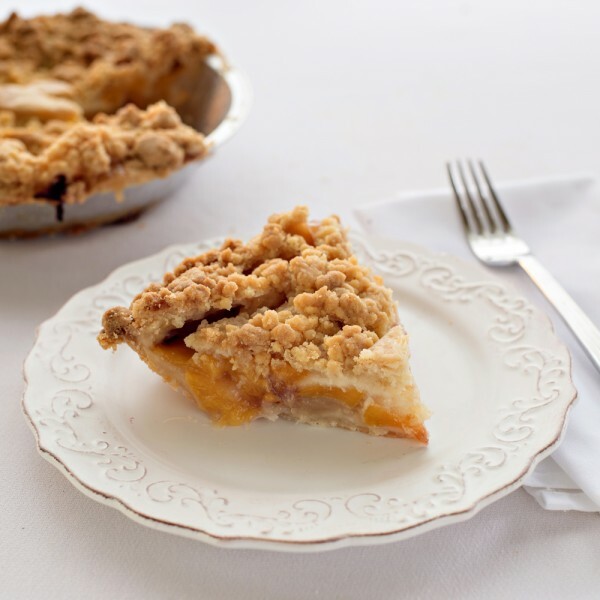 Then our fabulous toasted crumb topping is embellished with oatmeal and brown sugar to make this pie extra flavorful. A warm slice of this pie will keep you toasty on any of Michigan’s slopes. Rich, plump blackberries are stuffed into our flaky, pastry dough and topped with more of the same. 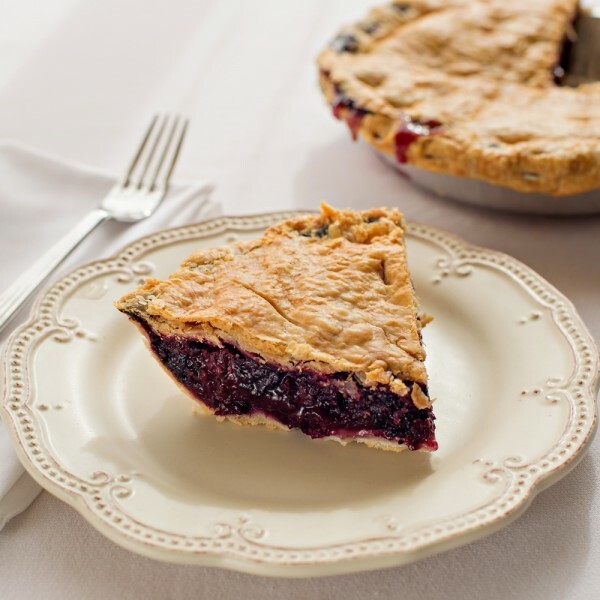 This pie reminds us of canoe trips and finding blackberries along your travels. 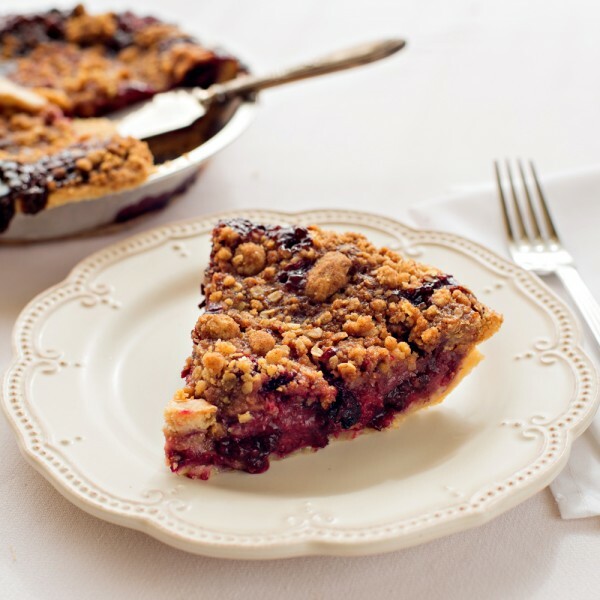 Sweet peaches and rich blackberries fill this pie, and then it’s finished with our toasty crumb topping. Every time you take a bite, think of the tall ships that cover Grand Traverse Bay all summer long. This pie is bursting with summer-sweet, plump Michigan Rubel blueberries. 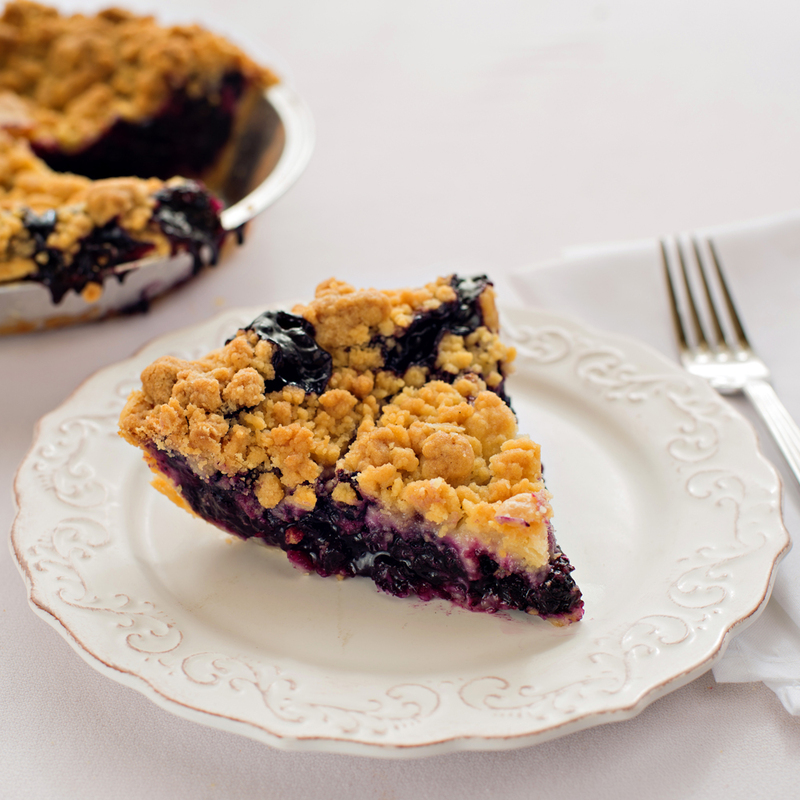 The blues never tasted so good until they are finished with our toasty crumb topping. This pie tastes as good as the look of the rich blue waters of West Bay in Northern Michigan. 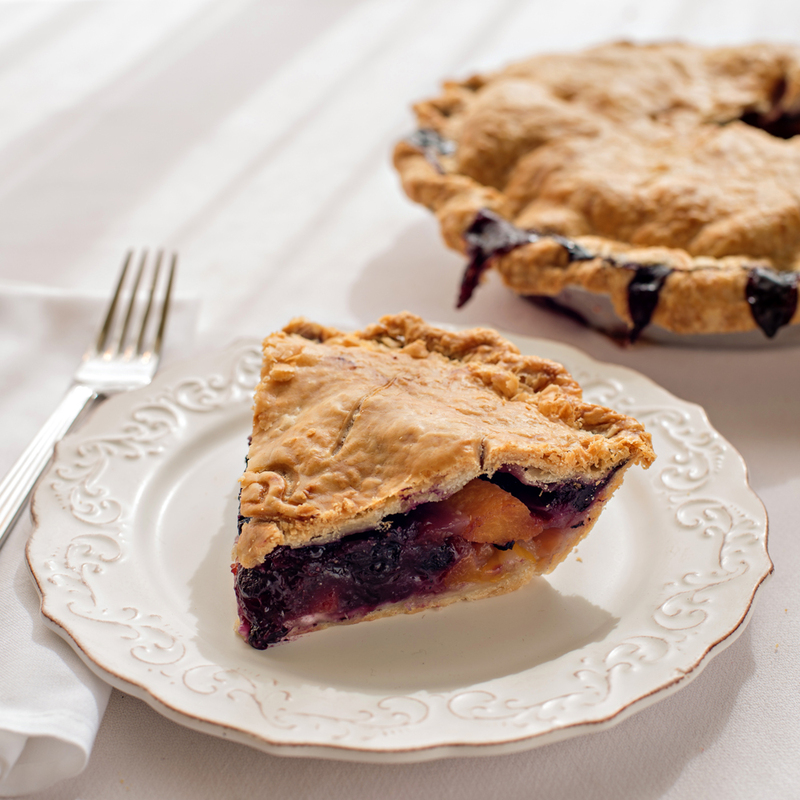 Sweet, plump Michigan Rubel blueberries are featured in our flaky pastry crust. A classic which reminds us of the sweet summer atmosphere of Suttons Bay, Michigan. Mix plump Michigan Rubel blueberries with our sweet peaches together and we have a pie so happy we can hear it singing from the rafters of the Traverse City Opera House! Sugar free! Sweetened with Splenda and featuring Michigan Rubel blueberries. 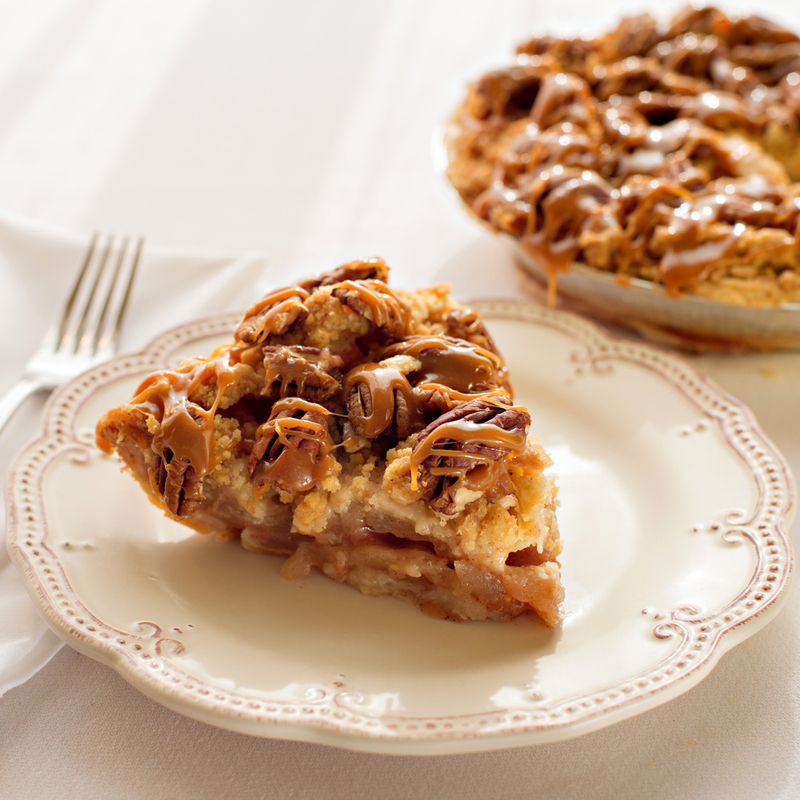 Sweets for all needs from GT Pie Co., simply splendid. 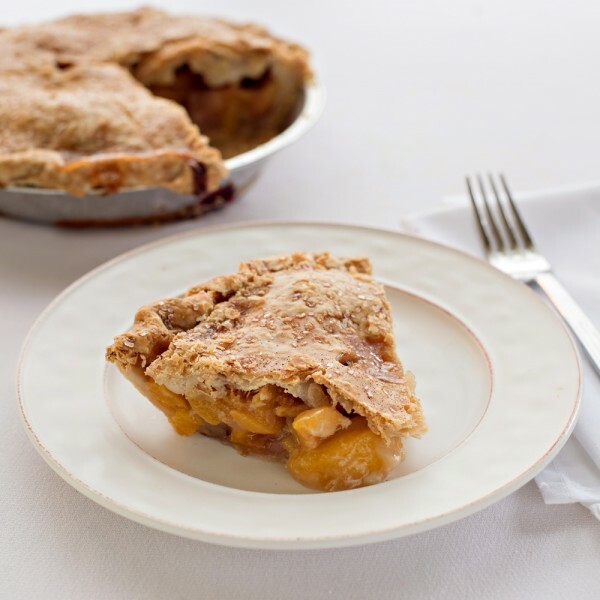 A golden filling of luscious, tree-ripened peaches, brown sugar and vanilla. Baked to perfection finished with our toasty crumb topping. 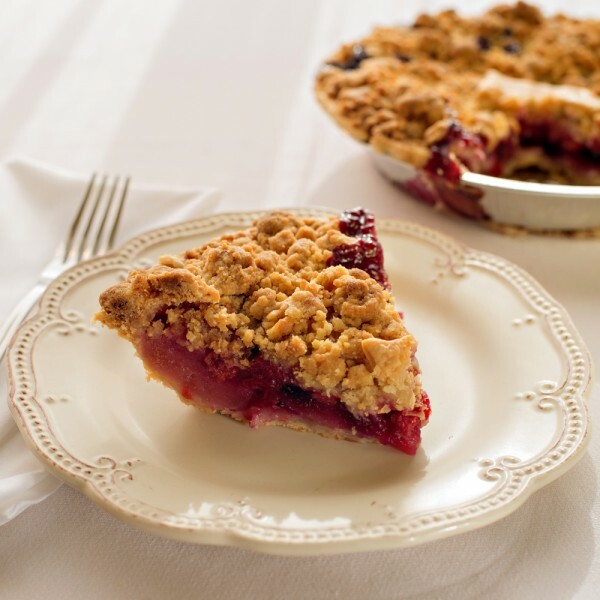 A wonderful pie to create memories of summer at your favorite Michigan beach. Sweet peaches, brown sugar and vanilla baked to perfection with cinnamon and sugar sprinkled on top of our flaky crust sprinkled. Enjoy with a scoop of ice cream for a heavenly treat, biting into these crisp peaches will have you pining for summer farmer’s markets. 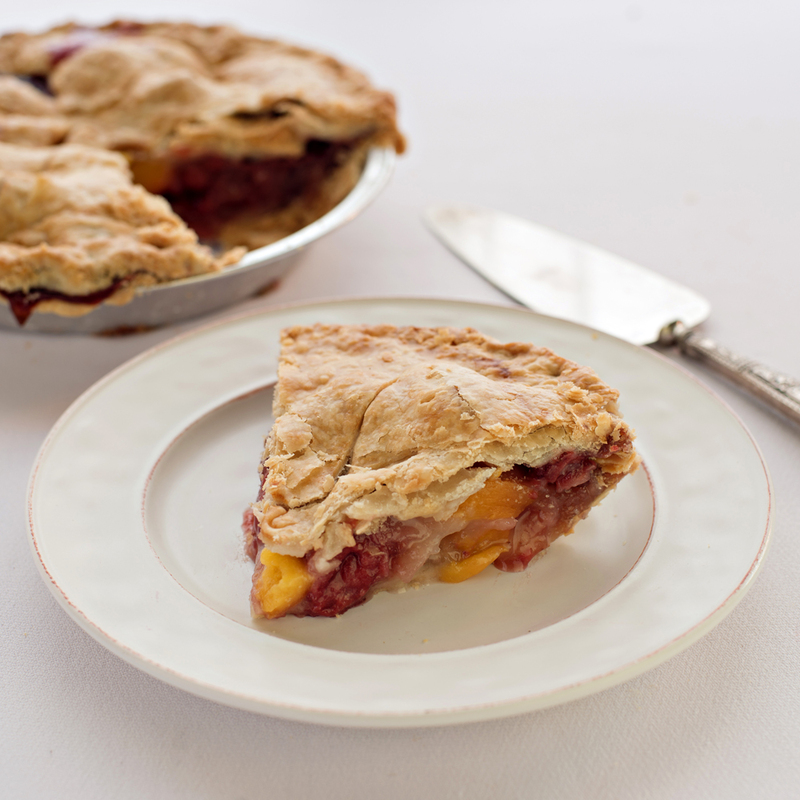 Sweet peaches and ripe red strawberries in our flaky crust make this pie a perfect, mouth watering combination! This pie brings back memories of being in the heart of downtown Traverse City. Think of rich summer sunsets at Good Harbor Beach. 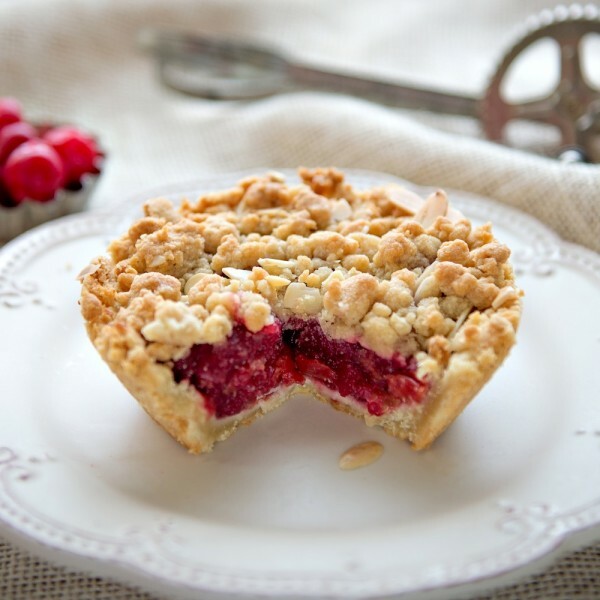 Plump red raspberries in a sweet filling and our flaky crust with a pastry topping. If you love raspberries this ones for you! The Leelanau Peninsula is a beautiful Up North Michigan treat and so is this pie! 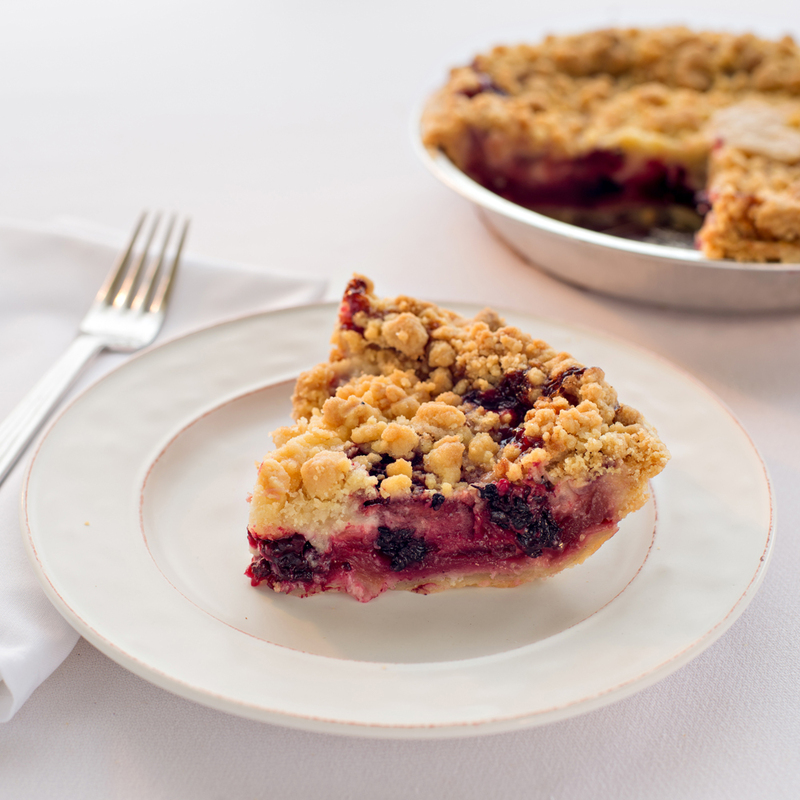 We blend plump red raspberries with Michigan Northern Spy apples and finish it with our toasty crumb topping. If you love rhubarb pie, you have to try ours. 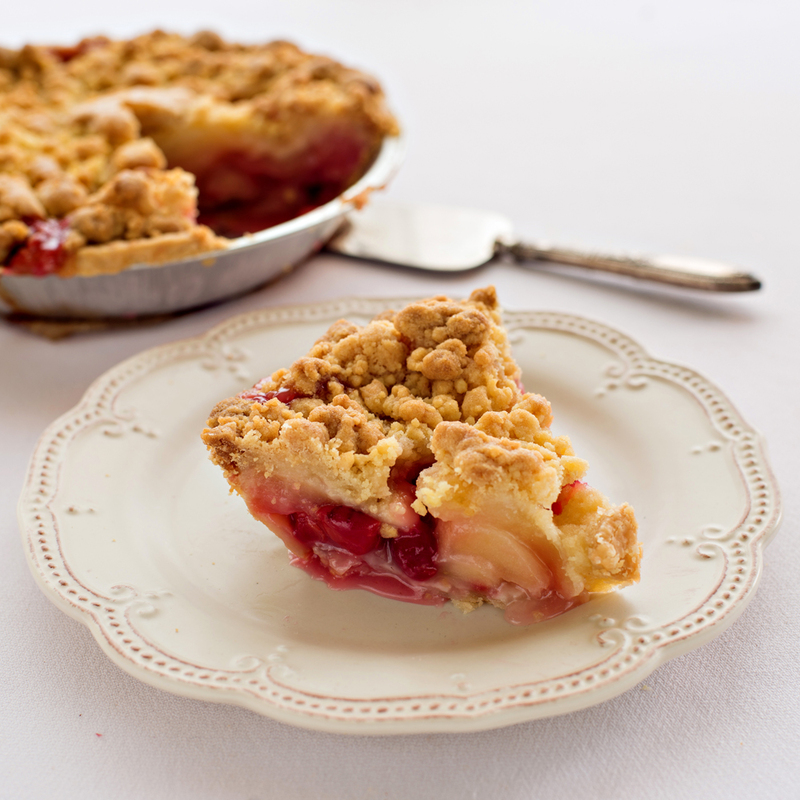 Tangy rhubarb, mixed with our sweet filling, all in our flaky crust makes for an amazing treat. A fresh taste reminiscent of brisk spring walks. Mixing the tart and the sweet with our toasted crumb topping makes this a sweetie pie to try. Nothing says summer like this classic combination. 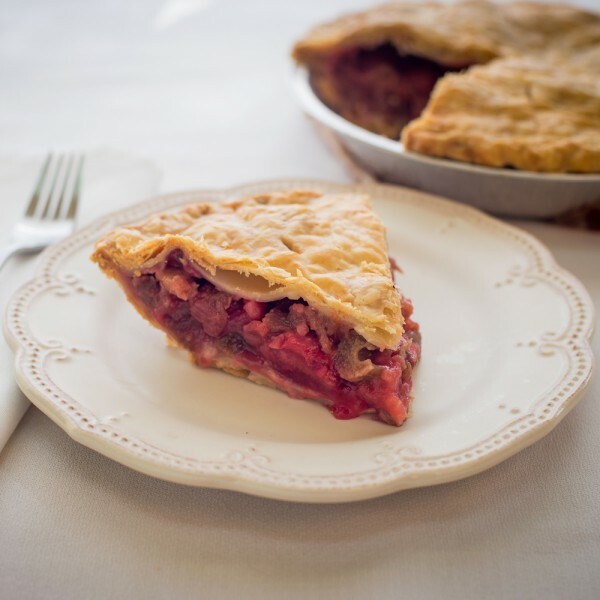 It’s a marriage between sweetness and tartness as strawberries and rhubarb come together to form a most perfect pie. 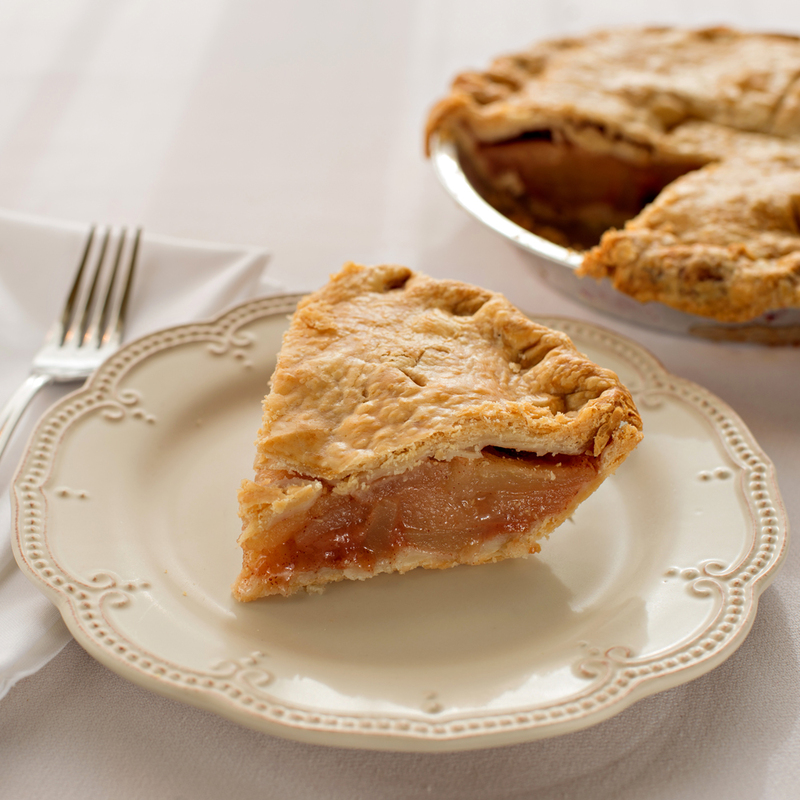 Handmade in our flaky pastry crust, this pie is in honor of the firefighters across the street from our original shop! 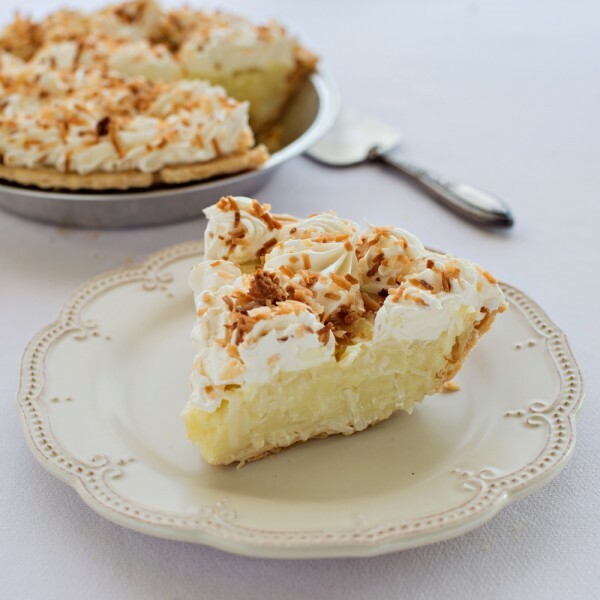 This pie is built from the bottom up – we start with our flaky crust, add a layer of sliced bananas, a layer of our creamy vanilla filling and finish it off with a yummy whipped topping. What would a picnic be at the park without Banana Cream Pie? Made with fresh milk, butter and eggs like in the good ol’ days. 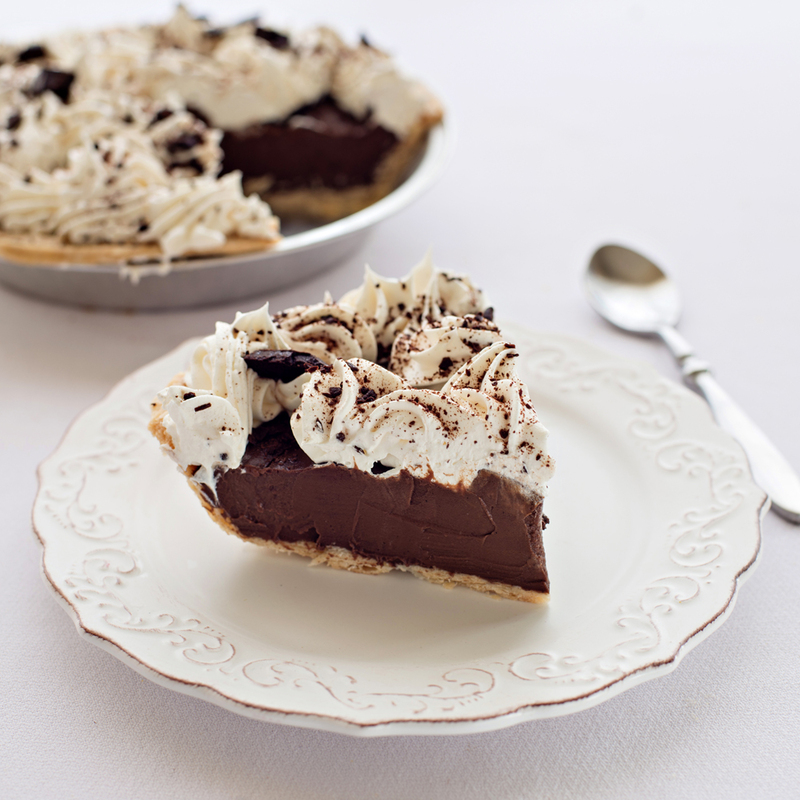 Rich chocolate cream sits atop our flaky crust and then it’s finished with whipped topping and chocolate shavings. 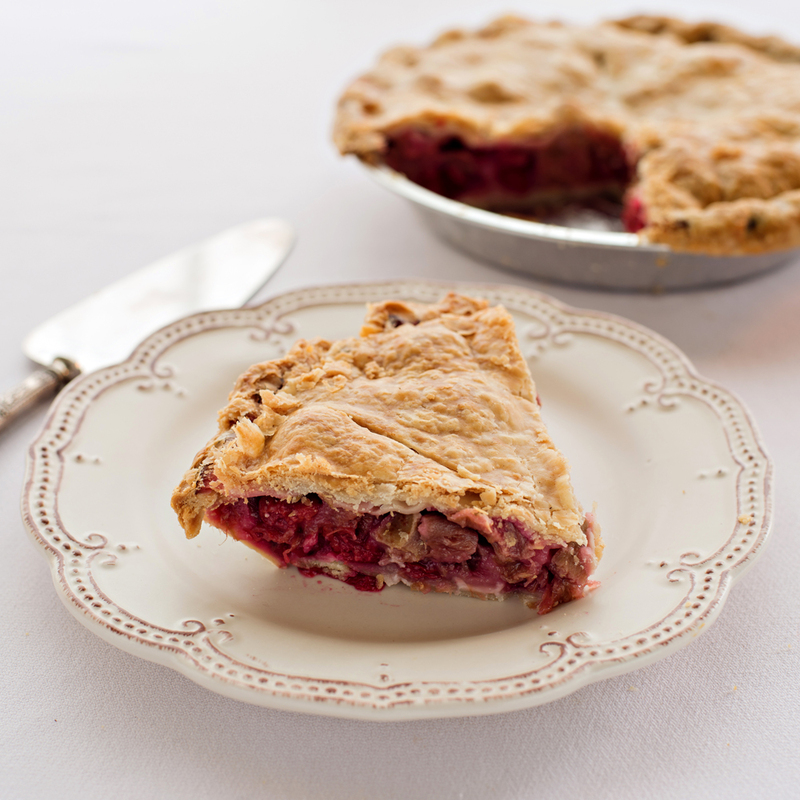 This pie pays homage to our amazing Old Town Traverse City. This handmade pie starts with a gluten-free shortbread pie crust, to which we add a chocolate cream blend of semi-sweet and unsweetened chocolate, and finished with a delicious chocolate whip topping and chocolate shavings. Its handmade taste is sure to thrill! 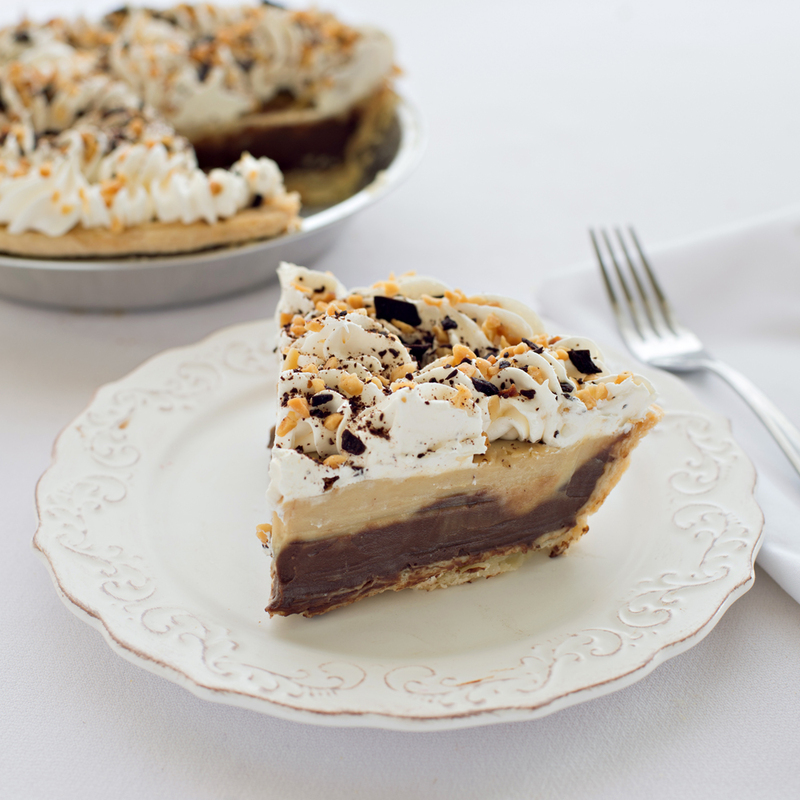 This popular combination requested often by Mike’s mom, Barb, starts with our flaky crust, topped with a layer of chocolate cream, followed by a layer of peanut butter cream. All finished with whipped topping and chocolate shavings. It’s like a Reese’s, but better! Our delicious vanilla cream is full of coconut flakes, loaded into our flaky crust and finished with whipped topping and toasted coconut. It’s a tropical treasure! 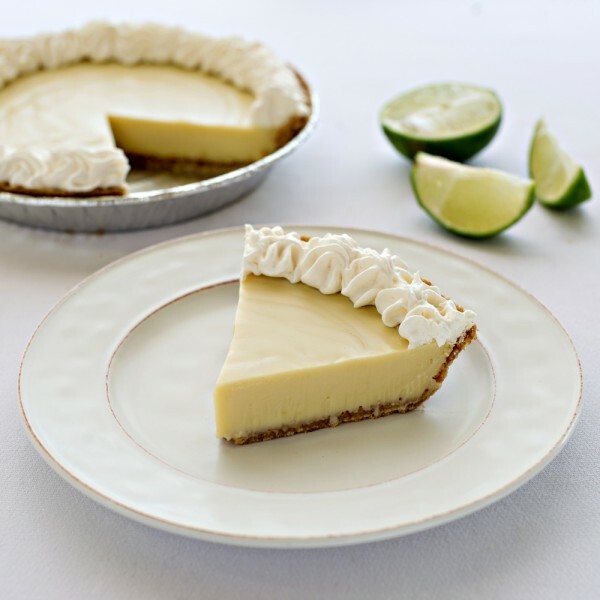 Made with real key lime juice, each pie’s cream tart filling is topped with fluffy, whipped topping rosettes and sits within a delicious graham cracker crust. The crystal blue waters of Petoskey make us feel like we have our own Key West! 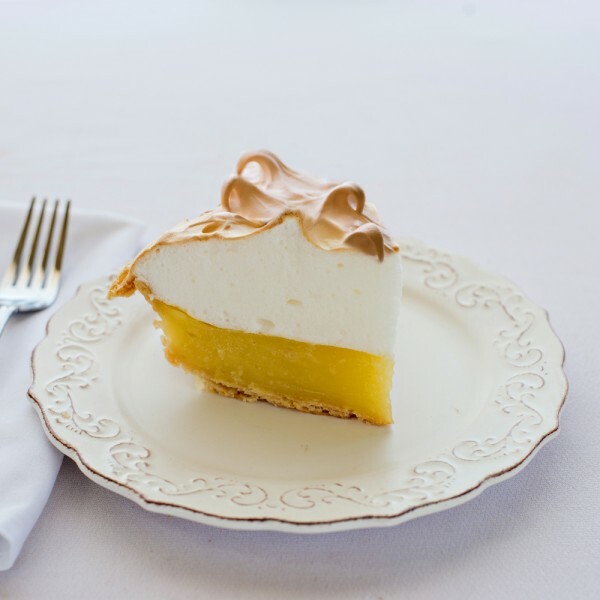 Made with real lemon juice and lemon zest, the tart filling is loaded into our delicious, flaky crust and topped with a mound of golden meringue. Pack your picnic basket with this pie as you travel the TART Trails of Traverse all the way up to Leelanau! 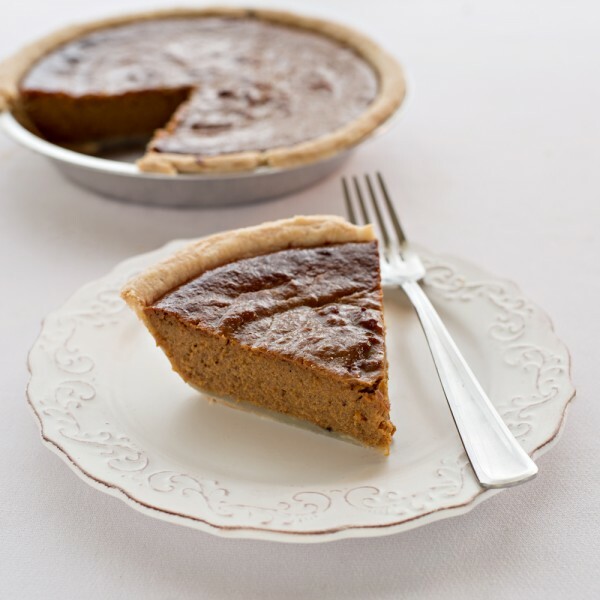 Our traditional classic pumpkin filling made in our flaky crust, but with a twist. 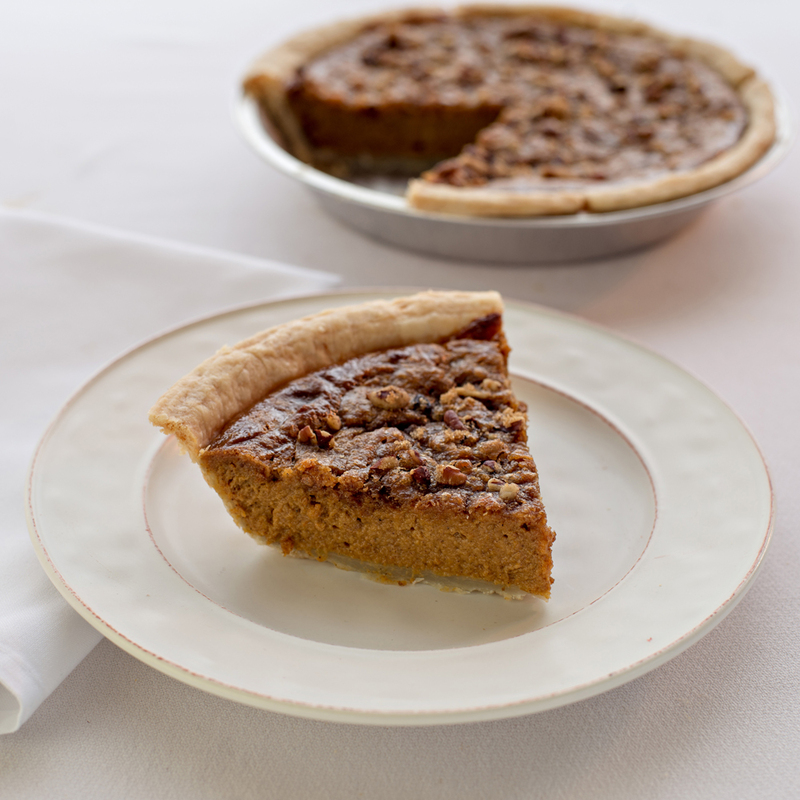 Toasted pecans layered on top with brown sugar give this pumpkin pie amazing flavor. A must try! And Grandma Genevieve will be happy you did. 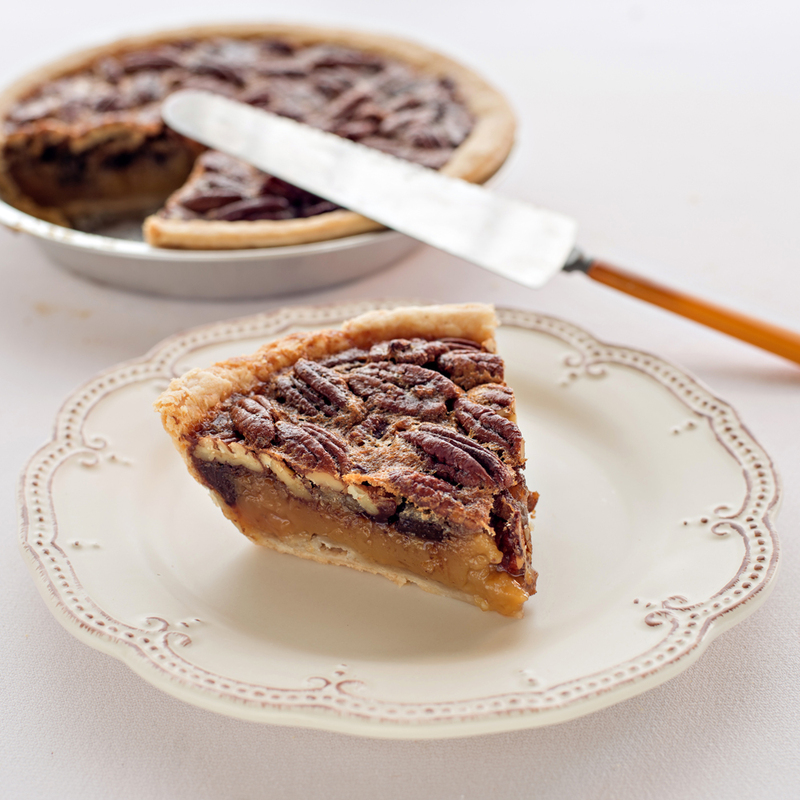 Our pecan pie is loaded with rich, gooey filling and mixed with an abundance of pecans, all baked in our flaky crust. Delicious! 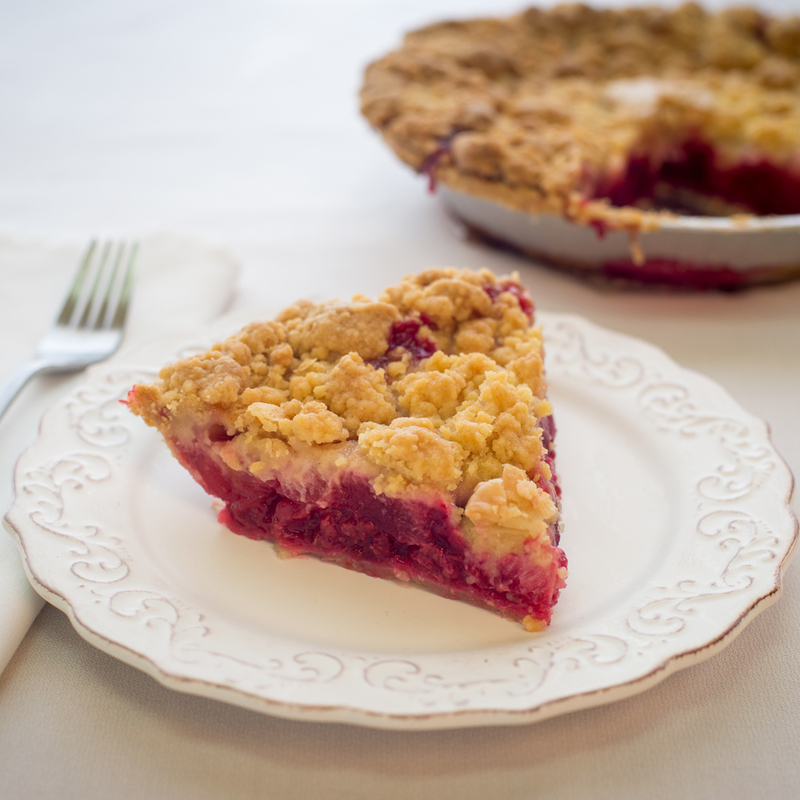 This pie will have you ready for a Northern Michigan fall! A Northern version of a Southern classic. 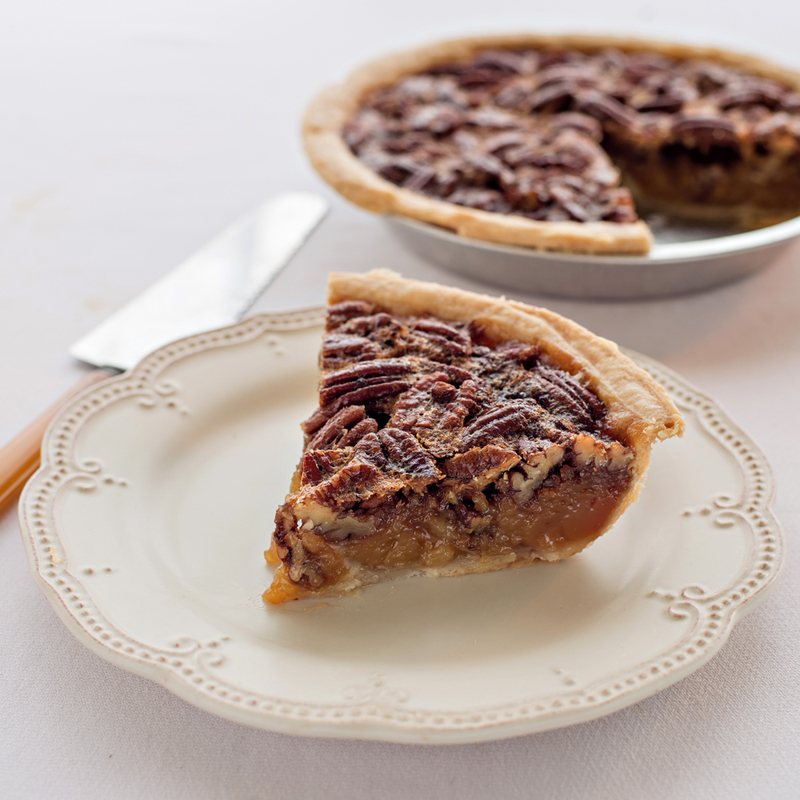 Handmade-from-scratch filling mixed with pecan halves and premium pieces of bittersweet chocolate chunks. Available for order year round all the way from Up North Michigan. 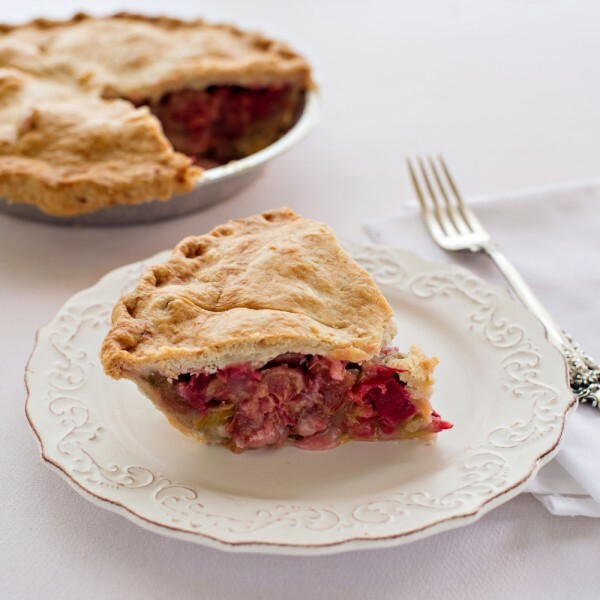 Fusion Pies are bold, exciting and made with a powerful twist as we combine unique flavors (and often add a new Michigan ingredient!). 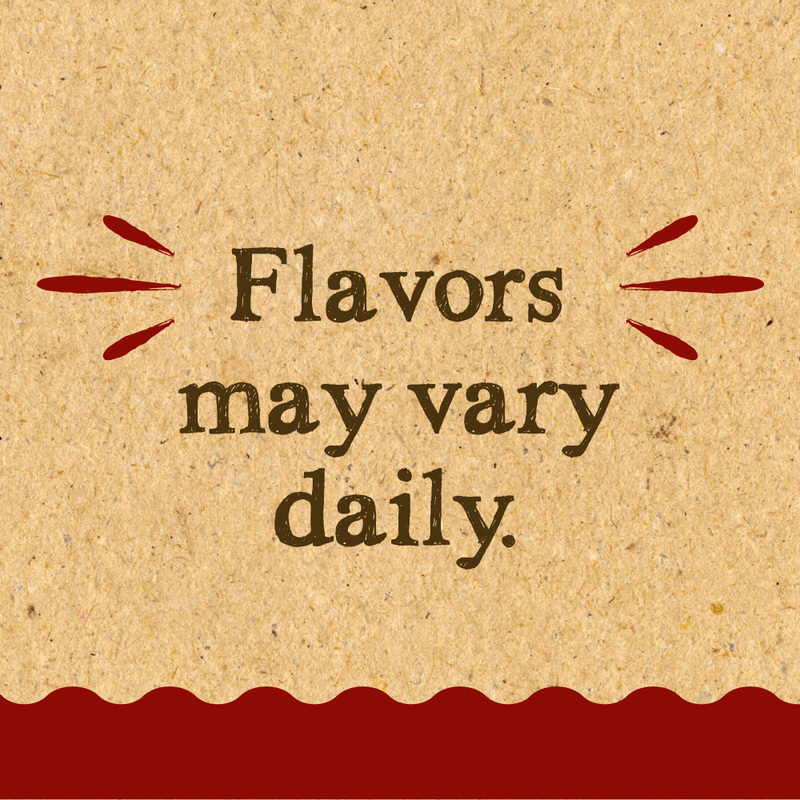 Some past creations include: CEO Chocolate Stout, Strawberry Champagne and Jammin’ PB&J. Stay tuned for these and new fusion creations out of the GT Pie bakery! Check your local shop for what is being baked today, as not all items featured here are available every day. Have a favorite? Let us know and we would be happy to bake it up for you! Download our full nutrition information guide and list of ingredients. 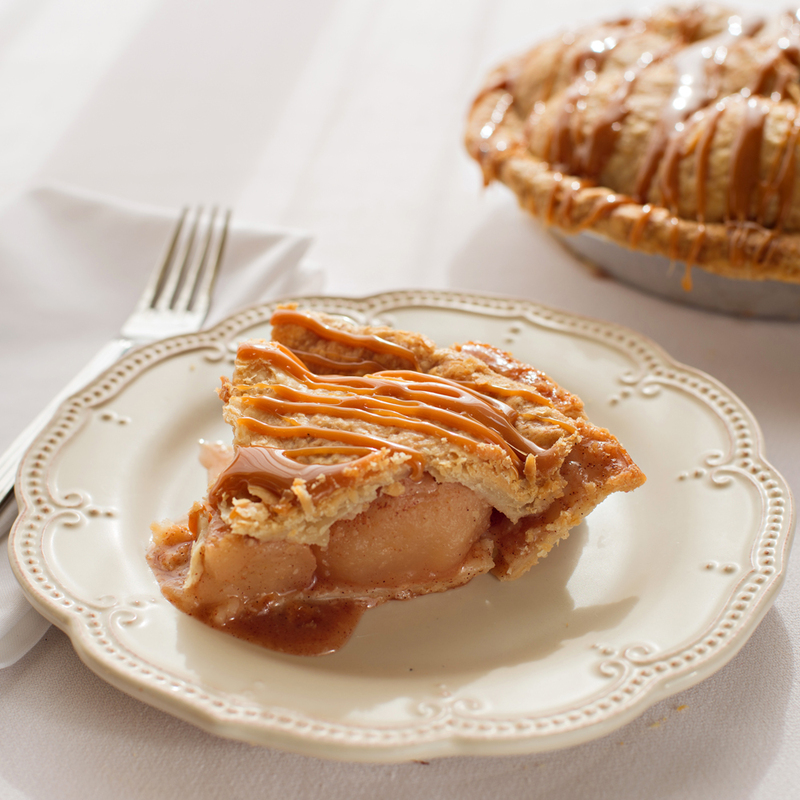 Menu and prices may vary by location, check with your local GT Pie Shop for item availability.